Marjoram is pleasantly aromatic herb and has a distictively minty-sweet flavor with slightly bitter undertones. Marjoram has gray-green leaves and clusters of white flowers. There has been some confusion in the past as to the difference between oregano and marjoram. All marjorams are oreganos, since the genus name for both is origanum, but not all oreganos are marjorams. Now oregano is the genus and marjoram, or sweet marjoram (Origanum majorana) is only one variety of over fifty types of oregano. Marjoram has a slightly minty, citrus taste with a hint of spice. Marjoram leaves are best fresh because of their mild flavor. The delicate flavor of marjoram may be lost if it is added too early in the cooking process, therefore add at the very end of cooking. It goes well in salads, dressings, eggs, and mushroom sauces. Marjoram is suitable for thick vegetable soups, pasta, fish, game, beef, chicken, sausages and meat loaf. The flavor also works well with cheese, tomato, beet or bean dishes. Marjoram is most often used in recipes of French or English origin. Create a tasty grilled chicken rub with garlic, salt, course black pepper and marjoram. 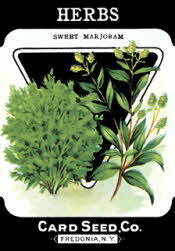 Marjoram and oregano are used as a steam inhalant to clear the sinuses and relieve laryngitis. European singers have been known to preserve their voices with marjoram tea sweetened with honey. Fresh marjoram tightly sealed in a plastic bag.